Martin's Driving School Customer Comments,Feedback. Thank you everyone that has left their review and feedback! You Stay Safe! A big thank you to Martin for helping me in learning to drive! When I first started, I was a complete beginner and a tad nervous. His high level of experience as well as his advice and guidance, allowed me to learn the rules of the road, and more, at a pace that suited me, has allowed me to become a more positive and confident driver. Would definitely recommend Martin, no matter your level of ability, as he is an amazing Instructor and honestly can't thank him enough! (Aiden E)(Plymouth Uni and Devonport). Just want to say a big thank you to everything you've done for me. I've not been the easiest student, you've allways kept your patience and encouraged me when I'm doubting myself! Thank you so much for helping me to pass and never giving up on me. I will definitely write a piece on my positive experience with you and how you handled someone with terrible nerves. Thank you so much. (Clare W)(St Budeaux). Thanks to Martin I passed first time! Brilliant Instructor. Would highly recommend! Thank you Martin! (David D)(Beacon Park). Passed the other day with Martin's help and patience! He's a great Driving Instructor who helps keep everything calm and simple! Would definitely recommend him to anyone looking for a Driving Instructor around Plymouth. (Jack B)(Cawsands). Passed today with Martin. Top bloke and great Instructor! Would recommend to anyone! Cheers Martin! (Frank C)(Liskeard and The Royal Navy). Good Instructor! Many thanks Martin! (Shaun B)(North Prospect). My son Ryan passed first time with Martin. He enjoyed every minute of it. Top bloke! Thanks again Martin for all that you've done for him. (Mark H)(North Prospect). Such a Fab Driving Instructor! So calm and patient! I only had a few lessons and passed first time! I'm so happy with the lessons. Would definitely recommend. (Jasmin D)(Hyde Park). Martin is a very knowledgeable Driving Instructor who will help teach you everything you need to know in preperation to your exam as well as the future of your own driivng. Very patient and keeps a positive attitude towards your learning. I reccommend Martin if you are looking for a Driving Instructor. (Josh A)(Ham). Cannot praise Martin enough! I was terrified the day I started, and today I passed first time. Thank you Martin for all your help and support! (Michaela L)(North Prospect). Great Instructor and a Great Car! I passed first time with him. (Dan L)(St Budeaux). Passed my test today with Martin, with only 2 minor faults! He has taught me absolutely everything. Kind, patient, caring and very calm! Hand on heart he is the best Instructor and top guy! Thank you so much Martin. (Emma H)(Laira). I passed my test today with Martin, loved every moment of driving as he was so patient, and went through everything with you step by step. Martin made me feel relaxed, especially before my test, which made everything better, so I wasn't nervous. I would definitely recommend Martin as a Driving Instructor! (Mel P)(Eggbuckland). Fantastic Martin's Driving School! Tyler passed his test today! All dancing around the front room...Thank you Martin for your patience, understanding and help. Highly appreciate and recommend you! (Tyler W)(North Prospect). Had a great time learning all the skills needed to be able to drive safely. Martin is a brilliant Instructor. He's patient and explains everything so you can understand it! It's all at your own pace too, Martin never rushed me into doing anything I was uncomfortable with. I passed today first time, with only a few faults. Thank You Martin! (Alex C)(Ernesettle). Finally passed my Driving Test. Thank you so much Martin! I was so nervous, I didn't think I would get there, but couldn't have asked for a better Instructor. He's very patient and freindly, and can pinpoint excactly where you need to improve on. I highly recommend him to anyone. Thanks again Martin. (Deena S)(Leicester and Plymouth UNI). Passed my Driving Test today! If there was a 10/10 rating, I would definitely give a 10. Even though he is my Dad, he had a lot of patience, and calm with me. Definitely worth going with if your'e looking to do lessons. Thanks for everything Dad! Wouldn't have done it without you! (Devon H)(North Prospect). Martin is a very patient Instructor, and spent a lot of time with me building my confidence (not an easy task!). I learnt a lot with him and couldn't fault his teaching, skills or patience. Thank you very much Martin. (Jenna M.)(North Prospect). Thanks so much Mart! Will miss you! (Natalie W)(Stoke). Massive thank you to Martin, who today has helped me pass my driving test and has been so kind, helpful and patient with me during my lessons. We got there in the end! Highly recommend! (Ella T)(Southway). Massive thanks to Martin for putting up with me and being so patient! We got their in the end! Couldn't ask for a better Instructor and highly recommend! (Elaina C)(Saltash). Just passed my test after a few months of tuition with Martin, couldn't recommend him high enough. Car is nice to drive and the Instruction is top knotch! (Stephen W)(The Wirral and The Royal Navy). When I first started with Martin, I had never been behind the wheel of a car, so I was nervous and a complete Novice. He soon made me feel at ease, and within the first lesson I was doing far more than I can imagine! I passed first time with Martin and certainly could not have done it without him! He's patient, flexible, walks you though step by step and great fun to drive with. I would highly recommend him. (Jemima L)(City Centre.). Martin has been an Excellent Instructor! Calm, Patient and easy to get along with. After putting off driving for many a year, Martin has given me the confidence and skills to take to the road. (James S)(Devonport). Thank you very much Martin! Was a pleasure to learn with you, and stress free! Thanks for getting me through it so quickly! Much appreciated. (Matt B.)(Devonport). I passed first time with Martin, with only a few minor faults. Great Instructor with lots of patience. Well structured and informative lessons, which fully enabled me to get the best out of each one. Wouldn't have passed so quickly without his guidance. Fully recommend. (Jon E.)(Efford). I had a first time pass with Martin. His patience is fantastic, he made me feel really comfortable, and stay positive. I really don't believe I would have passed so quickly with another driving instructor. His rates are fantastic and the car a dream to drive! Thanks again Martin! (Ross S.)(Ham). With so many Driving Instructors to choose from, Martin came highly recommended by loads of freinds that passed first time, it was a decision i wouldn't regret. Martin was calm and reassuring during the whole experience, and I was never messed around, he would always be there on time making the most of the time I was under tuition. Thanks to Martin I passed first time in super quick time, when I had no driving experience at all. I can honestly recommend Martin to any potential student no matter what your experience is, and no matter how nervous you are! Brilliant from start to finish!! (Regan M.)(Ham). I will highly recommend Martin! He's a brilliant Instructor, plenty of patience and has a brilliant sense of humour. He will always make sure you get the best abiity of your driving lesson. Massive thank you Martin for all your help! 5 Star Rating all the way. (Ryan H). (North Prospect). Thank you for all your patience and understanding! You are an amazing Instructor and would gladly recommend you to anyone! (Beki G). (Kings Tamerton). Thanks a lot for everything Martin! Couldn't have asked for a better Instructor. (Sam H). (Lower Compton). Thank you so much! Amazing teacher! Would recommend Martin to anyone. Always on time and very good at what he does. Thank you again. (Elliot M.)(Weston Mill and The Royal Navy). After chasing my previous Instructor for months, a friend recommended Martin to me. Was the best decision I ever made. In two short months I managed to pass. Highly recommend him. Lovely guy and a great teacher.! (Alicia P.)(Millbridge). Absolutely brilliant! I have nothing but praise for Martin. Calm and extremely helpful! Made the whole process so much easier. Each lesson always felt constructive and I always felt feeling I've made progress. Highly recommended. Thanks. (Paul D.)(Beacon Park). I have to say, without Martin's determination, patience, humour, effort and 'never give up' mind, I believe that it wouldn't be possible to have passed. I believe there isn't another Instructor who shares these great qualities, so thanks a lot for all your hard work in getting me to success! (Definitely should book your place!) (Jake T). (North Road West). Thank you Martin. I would also like to thank you again for helping me pass first time, and I appreciate how patient you were with me! (Jack S.)(Peveral). Can't thank Martin enough to help me pass after failing with a previous Instructor. Martin helps you to become a confident driver, is calm and patient and will not let you give up until you feel 100% confident with anything. He is good at talking through manoevres which I really struggled with! I would really recommend Martin! (Michelle B). (North Prospect). Martin is a fantastic Instructor, really builds the confidence of a first time driver, and was allways really flexible with any problems that you might have and help you correct them. Thanks Mart! (Ben Luscombe).(Derriford). Thank you for being a good teacher! (Danielle B. )(North Prospect). I can't thank Martin enough! Passed first time with only seven minors and not to many hours either. He is very precise in every aspect of the drive and how he guides you to perform it. He's an easy going guy who just wants the best for you. He doesn't hold you back and helps you believe in your own ability. I would highly reommend Martin to anyone. (Pete W.)(St Judes). Very Good helpful Instructor. Definitely recommend this company. (Kasia A.)(Efford). Fantastic Driving Instructor! Has the patience of a Saint! Would recommend to anyone who is starting to drive, or even just a refresher! Enjoyed every moment. Thanks again Martin. (Dan W)(Whitleigh). Brilliant Instructor! Would definitely recommend him! (Rebecca B.)(Ernesettle). Martin was always honest with me and explained brilliantly what I had to do. Prepped me well for my test day and was supportive throughout. I highly recommend his services! Brilliant bloke and a fantastic Instructor. (Pete T.)(Keyham). Martin is a brilliant driving instructor! Would highly recommend to new drivers. He helped me build my confidence. Thanks for all your patience, guidance and helping me pass first time. (Abby T.)(Torpoint). If your thinking about learning to drive, this is definitely the place to go! Martin has the patience of a saint, his teaching manner is faultless. I had no confidence at all starting out, and now I have a driving licence! Thank you so much for all the effort you put in with me Mart! Eternally grateful! (Sue R.)(North Prospect). Brilliant Teacher! Super patient and encouraging. Doesn't make you feel you're having a lesson. Always constructive and enthusiastic. Passed first time!.....Jess T.(Southway). A Great Day! A good safe drive, knowing everything I needed to know, thanks to Martin. Thanks Mart. (Terry Y.)(Mutley). Thank you so much Martin. Could not have been asked to be taught by anyone better. Cheers for everything! (Bradley L)(Devonport). Highly recommended Driving Instructor. Very good teacher and was very patient with me! Thank you for all your help! (Molly A)(North Prospect). Thank you very much Martin. Well pleased with the help with lessons and would recommend Martin to anyone as he's really good. Thank you again mate! (Frankie)(Leigham). After being left in the lurch by a previous instructor just weeks before my test, I was left in a panic trying to find an Instructor that would take me on at such short notice. I couldn't of asked for a better Instructor. Martin is patient, engaging, encouraging (even if you've messed up!) and makes you feel confident in your ability behind the wheel. I passed first time and would 100% recommend too anyone. Best Instructor BY FAR out of the 4 I've had! Thank You Martin!. (Chloe P). (Bridgend and Plymouth Uni). Passed my test first time today in just over 3 months having no experience with cars. Martin is very patient with new drivers and tells you everything you need to know about driving. (Dan W.)(Crownhill). Brilliant Instructor and would recommend to anyone who is looking into doing lessons. Martin makes sure you get the most out of your lessons and is very patient and friendly! (Samantha B.)(Southway). Absolutely amazing Driving Instructor too do your lessons with! Friendly and helped me so much. I passed first time today. (Amy M.)(North Prospect). Thankyou for everything! Excellent Instructor who helped me pass first time. Highly recommended. (Bethen H.)(Torpoint). Thanks a lot Martin. Highly recommended, patient Instructor who got me through my test first time, with only 20 or 21 hours. Thanks again. All the best. (Ayman Zaid)(Bath and Plymouth Uni). Excellent Driving Instructor. Martin is very patient, calm and encouraging. He helped me learn what I needed to do to get through my extended test. I would recommend Martin's Driving School! Having access to the Theory Test Pro app was also very helpful. Martin is thorough in his approach and I appreciate all his help in passing my test. Easy car to learn and drive in. Overall a great experience learning to drive with Martin! Thanks Martin! (Allen G.)(Whitleigh). Fantastic Instructor. Highly recommended. Really thorough and helpful across all areas of learning to drive. Great value for money. Thanks very much Martin! (Chris K.)(Mount Gould and Plymouth Uni). Thank You so much for the hard work Martin, couldn't have passed first time without your patience with me! Thank You! (Gemma B.)(Stonehouse). Top Lad,got on really well, explains everything in good detail to help you understand. Passed first time in a short period, very comfortable and easy car to drive. Would recommend to anyone! You definitelty get what you pay for! (Ryan S.)(Stonehouse). Hi Martin. Just wanted to say a huge Thankyou for all your help. After 17 years of trying, having a real confidence problem, I finally passed my test under Martin's tuition. His tips on talking yourself into safe decisions by narrating your drive was what got me through. I would and already have recommended him to other people. Thanks for everything! (Leighanne H.)(St Judes). Best Instructor by far. I've been through 3 and his resourses and Instruction is by far the best! Definitely a recommendation! (Sam W.)(Plympton). Very good Instuctor. I would recommend him to anyone. I'm quite sad it's over but in the end it was Martin who got me through it. (Paul B.)(Ernesettle). Thank you so much Martin! You are a very good Instructor who make me feel confident to driving safe and I pass my test today! Highly recommend, Martin is friendly patient and knowledgeable. (Arisa W.)(Barne Barton). Thank you so much Martin. You're a great Instructor and highly recommended. Thanks for your time, patience and knowledge. (Chris M.)(Honicknowle). For once in my life I have completed a New Years Resolution.....I passed my driving test! Thanks Martin for your patience and help! (Jemma M.)(North Prospect). Martin is an excellent Instructor. He is patient, easy going and takes time to explain every detail in a manner which is both informative and enjoyable. His use of technology is particularily useful in helping to gain an understanding of the road. I found Martin very good at building my confidence on the road. Couldn't have passed without him. I would recommend him highly! (Lewis W.)(Plympton). Great Instructor. He is really patient and supportive. Would recommend to anyone. (Caleb H.)(Devonport). Compaired to my first Instructor, Martin was a breathe of fresh air. His manner of teaching was patient and very easy going. Instead of just pointing out my flaws, he would take the neccesary time to explain my weaknesses and more importantly how I could improve, to become a more competent and safer driver. Oh...and did I mention I got a free Pen! What more could you ask for? Fantastic Driving Instructor and a genuine top bloke. Thanks Again.....Carl H.(Liverpool and The Royal Navy). I was quite nervous starting off but Martin helped me build my confidence, which resulted in a first time pass. Martin was allways on time, proffesional and friendly. His clever use of technology really helped my progress, being able to watch my mistakes via replay helped me a lot. Would definitely recommend.....Jake R.(Beacon Park). I passed my driving test yesterday first time! I would definitely recommend Martin. He is very friendly, patient and made me feel relaxed ready for the test. He was consistently very helpful, demonstrated by my first time pass! Thank you very much Martin!.....Lisa H.(Bristol and Plymouth Uni. Passed my test with Martin after coming across from a different driving school. Brilliant Instructor, very patient too! Highly recommend to everyone.....Georgie C.....(Trematon). Brilliant Instructor, Great Guy! The man deserves an award! Thanks Martin,I'm over the moon! Tony B.....(North Prospect). Couldn't have picked a better Instructor. Would recommend to everyone! Thanks Mart!.....Reece L.(North Prospect). Brilliant Driving Instructor! Has helped me so much and has great patience, would recommend him to anyone! Thank You so much, first time pass! !.....Rebecca P.(Ernesettle). Very helpful and patient Instructor. Goes the extra mile to help you pass. Would recommend to new and nervous learners. Thanks Martin.....Patrick B. (North Prospect). Before I met Martin I failed my Theory Test. After using Martin's Theory Test Pro App I was able to comfortably pass my Theory. I Passed my Practical Driving Test first time thanks to Martin's excellent Instruction. He is a calm and patient Instructor, who's aim is to get you to a pass standard. I would highly recommend Martin as a Driving Instructor.....Tony M.(Ernesettle). Thank you for having the patience to teach me to drive. I've got insured now and I am on the road! The best Instructor, allways calm and taught me some great tips! Thank you again.....Catherine W.(Mannamead). Would recommend Martin to anyone, very patient especially when I kept making those silly errors! With help from Martin I managed to pass first time. So many thanks again!.....Georgia M.(Swindon and Plymouth Uni). Just wanted to say thanks again for everything and getting me up to scratch to get through my test. Can't believe I passed first time! Brilliant tuition and patience with my many silly mistakes. Definitely recommend to my family who need to learn. Thanks again.....Kyle S.(Torpoint). Martin is a brilliant Instructor, very patient and was able to book my lessons on days and times that suited me. I passed my test third time thanks to the confidence and fantastic Instruction I received from Martin.....Michelle C.(Southway). Great Instructor, makes you feel relaxed and teaches you really well. Never let me down and got a pass first time quite fast. Thank you for all your help.....Logan P.(Keyham). Martin is an Excellent Instructor. He gives really constructive feedback and focuses on your weak areas in lessons. Martin encourages you to learn at your own pace and has a very likeable personality as well! I will miss my lessons with Martin, highly recommended.....Chris M.(Ham). Firstly Thank you Mart! I was very nervous when I started driving with Martin, as I was new to Plymouth and recently failed my first driving test. Martin gave me a lot of confidence by showing me lots of test routes and focusing on any areas I struggled with. He was also flexible with lessons and had a lot of cool, helpful driving apps on his tablet. Would highly recommend Mart! Chloe B. (Exeter Uni and Horsham)(Picture About Page).. Highly recommend Martin to everyone. He is very patient and supportive throughout all lessons. Thanks for everything! Jack. M.....(Eggbuckland). A brilliant Instructor, very patient and understanding. Let me learn at my own speed and didn't pressure me. I was avery nervous driver, and Martin helped me be more confident. I would highly recommend to anyone! Thank You! Zoe. L.....(Liverpool). I would highly recommend Martin for driving lessons. He was flexible and helpful. I felt really at ease with him. I passed my test within 2 months of taking lessons and I can't thank Martin enough for his help! Thanks mate!.....Joe.(Pennycross). Completed my training in Plymouth and passed first time in Birmingham. Credit goes to Martin due to his continuing support, patience, and understanding when I got frustrated! His teaching programme is easy to follow, with free Theory Test Pro and Driver Active Programmes which were a great help. I was impressed with his punctuality, friendly approach and amusing fun teaching techniques. The car was always clean and a dream to drive! Thanks Mart for the experience, that I thought was to be a nightmare, ended in a dream come true! Take care.....Kelly. (Birmingham and Plymouth Uni). I couldn't have asked for a better Instructor than Martin! He is friendly, patient and most of all...a great teacher! I enjoyed the whole process, from start to finish, and the fact that I passed first time with one fault, is surely a testament to Martin's skills as an Instructor.....Anthony C.(Whitleigh). Really can't praise Martin enough! Such a great Instructor and so patient. Highly recommend if you're wanting to start lessons. He never gave up on me and allways got me through when I wanted to give up! Thank you for all your support Mart! Best Driving Instructor in Plymouth!......Carly J. (North Prospect). Well what can I say? The praise I give to Martin isn't nearly as much as he deserves! Such a friendly guy, and a great Instructor. The service I received was excellent! Martin is very approachable. His positive attitude helped me to acheive my pass and I can say without a doubt, he has changed both mine and my family's life forever, which won't be forgotten. If your looking for an Instructor...look no further. I must say, although I passed today, I'm over the moon, but will really miss having our chats during lessons. Drive Safe Mart and thank you for everything.....Dan W.(Barne Barton). Thank you Martin, you have been a huge help which passed me first time! I would definitely recommend you!! Thank you......Cameron C.(North Road West). Martin really gave me the boost I needed to finally complete my driving test. He was very encouraging and patient, thanks Martin, you're a star!..... (Kate D.)(Efford). Thanks to Martin's great patience, I passed my test first time! A great teacher who is very calm and understanding about all of your nerves! Thanks Martin!.... (Rhian R.)(Manadon). Thanks for everything Mart! Couldn't have picked a better man for the job!.....Jack B.(Peveral). Thank you for all your help Martin to pass my test. Would definitely recommend you to my people. Great Instructor!.....Collette B(Keyham). I Passed first time!! Thank you for being patient and calm, and for your encouragement. I found that the lessons were challenging, but went at a pace which suited me. I would recommend Martin to anyone!.....Ashleigh Marie Rust.(Torpoint). Many thanks for helping me pass in time for starting my new job! Your calm, friendly teaching style, and use of teaching aids (pictures, diagrams, etc) were extremely helpful. I will recommend you to anyone looking for driving lessons! Geoff W.(Pennycross). Passed first time thanks to Martin and his vast experience and patience. He puts a lot of belief and confidence into You to pass your test, and would highly recommend him to anyone who wants to pass their test as quickly as possible! Thank you Martin.....Tom.H. (Crownhill). Thanks a lot Martin! Passed first time! An excellent Instructor who I would recommend to anyone.....Tom.B.(Torpoint). Passed my test first time today! All with the help of Martin. He is a great Instructor! He is patient, relaxed and encouraging. I had fun in the lessons and they were completely proactive every time. I would recommend him to anyone and everyone! Thank you again Martin!.....James A.(Crownhill). I Passed my test first time today and its the best feeling ever-all thanks to Martin! He's a fantastic Driving Instructor who's patient, understanding and gave great encouragement to me throughout my lessons! Thanks for everything Martin!.....Emily B.(Bristol). A great Instructor, very flexible and very patient! I felt very at ease when learning to drive with him, great for nervous learners! I would highly recommend Martin to anyone who wants a good, Professional reliable Instructor, and very competetively priced. Thanks for everything Martin.....Rob F. (Reading and Mannamead). Martins a fantastic Instructor. Patient, relaxed and encouraging. He had me up to test standard within a few weeks, helping me to resolve some underlying issues I had with my driving. I passed first time and this was in no little part down to his ability to clearly communicate what I needed to improve on and how to do it. Would highly reccommend Martin as a Drivng Instructor. Thanks for helping me get through my test! You made the process far more comfortable than my previous Instructor!.....Nick K. (Somerset and St Judes). Thanks a lot Martin! New to the Plymouth area and he made me feel very comfortable and relaxed within the car, definitely wouldn't have be able to do it without him! Thankyou!.....James G. (High Wycombe and Plymouth Uni'). Thankyou very much Martin. You are a very good Instructor with lots of patience! Hope to see you out and about.....Jackie S. (Plympton). An absolutely fantastic Instructor! Managed to squeeze me in for a couple of hours after my previous Instructor changed his availability. Martin managed to get me all set up with an additional 4 hours in his car before I was scheduled to take my practical! Could'nt have done it without him! Many thanks for helping me acheive one of lifes stages and was a great pleasure to say that he was the one that got me the certificate on the day! Would recommend Martin to anyone and everyone! Thank you again so much Martin!.....Alex Rawling. (Eggbuckland). Thanks Martin! I had a great time learning to drive in Plymouth. Made me feel calm and confident about taking my test. Thanks again.....Lucy K. (Bedford and Plymouth Uni.). Great lessons, very patient and understanding. Would highly recommend to confident and nervous drivers alike. I passed first time and very impressed with the service I received.....Lewis N. (Weston Mill). Thanks to the helpful guidance and brilliant support from Martin's Driving School, I now have a foot in the door to a new life. Thank you Martin, it was all because of you!.....Ryan J. (Modbury). I would like to thank Martin for being a brilliant Instructor. He is very kind, patient and more friendly. I highly recommend him to anyone. Thankyou ever so much! (Clarise M.).....(Plymouth Uni and Stonehouse). Awesome bloke to learn with....easy going, knows his stuff and a general decent bloke all round, thanks again Martin!.....Gavin R. (Pennycross). If your going to pick a Driving Instructor, then pick Martin. It's with his patience, knowledge and understanding I passed first time! Thanks again Martin!.....Chris S. (St Budeaux). I felt so lucky that I have learnt driving with Martin, who is highly skilful, knowledgeable and professional. At the beginning I was very nervous, but Martin has been just brilliant. He can make students feel comfortable and enjoy driving. In less than 3 months, he has taught me all the important skills and knowledge for safe driving. Without his outstanding teaching method, I would never been able to pass my Practical Test first time. Driving is not as difficult as I had imagined at all when learning with a great teacher like Martin. I'm sure many more of your students will enjoy the learning experience with him like I did. Many Thanks!.....Jenny X. (Beacon Park). Martin was the second Driving Instructor I had who made me feel so much more at ease, and felt like I was progressing much faster. He is patient and friendly, and I highly recommend him. Thanks for everthing!.....Amy Y. (Weston Mill). Would like to thank Martin for being a brilliant Instructor. I couldn't have passed first time without him. He is very patient and I would highly recommend him. Thanks again.....Ben W. (Eggbuckland). Learning to drive is a difficult process, but I found Martin to be a very patient, informative and freindly Instructor who made my time as a Learner as Stress-Free as possible. I passed both my Theory Test and Practical Test first time with his help and guidance, and I'm very grateful to him! Thanks again.....Alice B (Peveral). I would like to take this opportunity to thank Martin for his time and patience in teaching me drive. He is an excellent Instructor who I would certainly reccomend to anyone. Thanks again.....Ken C (North Prospect). Thanks Martin for helping me Pass my Driving Test in Plymouth. Very motivating. Anyone looking for a Good Instructor pick 'Martin's'. Very friendly and Patient guy. Will allways concentrate on areas You need to improve. I definitely look forward to doing my Pass Plus with this guy.....Howard D. (Plymouth Uni). (Mutley and Manchester). What to say after You helped me Pass My Practical Test? You Trained Me to know what is Essential to not only Pass The Test, but also to Drive Safely. Thankyou for Your Professionalism and Friendly Attitude, I've enjoyed being Your Student, THANK YOU MARTIN!.....Charly K. (Plymouth Uni) (Stonehouse and DR Congo!). Martin was my first and only Driving Instructor. When I first got in the car I had never driven before, and Yesterday I passed my test First Time (after only 40 hours). Martin gives Excellent Tuition, is Patient and most importantly constructive rather than dismissive when discussing errors. I would like to say Thankyou for getting me through first time and recommend Martin to anyone looking for a great Instructor.....Jake R. (Eggbuckland). Passed my Test today. 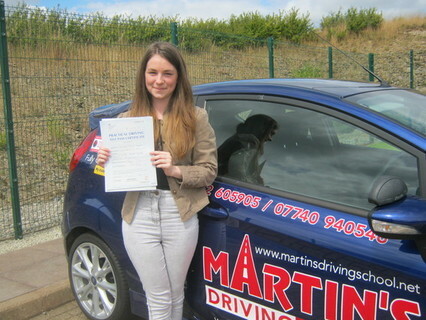 First Student of Martins to take the New Independant Driving Test. Thanks to Martin I passed with only 1 Minor Fault. Every Lesson was Productive and as equally fun, especially as Martin has a good sense of humour and is very calm and relaxed. Martin has taught me to Drive Safe, not to just pass the Test, training I will allways use whenever I get behind the wheel of a car. Thanks again Martin.....Steve B. (Ernesettle). Thankyou again! Calm and Consistent Training that definitely paid off! A Very Professional Attitude to Teaching and Training.....Ashley R. (Peveral). Martin is a Good Instructor. He is very patient, and He spent time to explain everything for Me. He also helped build up my Confidence. Although I didn't take my Test In UK, but He taught me all Basic knowledge which I use well, and here I am, I can drive In Hong Kong and Everywhere! Many Thanks.....Elain K. (Plymouth Uni.) (Hong Kong). Martin was Understanding of situations, and was allways as flexible as possible. He got me through at my own pace, and onwards with much more confidence and awareness. Many Thanks.....Brett B. (North Rd West). Passed on My first Attempt thanks to Martin. A Great Instructor who I would Highly Recommend to Anyone! Every Lesson was Fun as well as Being Productive. Many Thanks.....Tom K. (Milehouse). Well what can I say? Passed My Test first time today and it feels Great! I previously had 40 Hours with a different Instructor and never felt I was moving forward. I had 20 Hours with Martin and here I am...a Driver! I could not have done it without Martin. He allways made sure I Understood everything and helped Me calm down when I got frustrated. I cannot thank him enough and would recommend him to Anyone. Will miss My Driving Lessons very much and will miss the laughs we had. He always made Me feel comfortable and has a great sense of Humour!. Thanks again Martin!.....Pippa H. (City Centre). I passed my Test First Time after 22 Lessons. I had previously tried to learn with another Instructor, but didn't feel I was Progressing. It was the complete opposite with Martin. Not only was he Patient, He provided Progression. I felt I was moving on with my Learning. Each week We were tackling different areas which I needed to learn. it took Me 3 attempts to pass my Theory Test and almost gave up Hope. Martin on the other hand, gave me the Confidence to carry on. He even offered Me a 'Free' Theory Lesson, where He was happy to go through the Test, Including the Hazard Perception. The Car is a 'Dream' to drive! Martin has even fitted it with special Blind Spot Mirrors to help with Manoeuerves. (They really do Help!) I would definitely Recommend anyone to Learn to Drive with Martin. Not only is He Good Value for Money, He's Very Patient and an Excellent Teacher. He manages to Calm You down if You become Stressed or Nervous, as I did on Many Occasions! I will miss My Driving Lessons. Once Again, Thankyou Martin!.....Martin F. (Peveral). Martin helped me to Pass my Test on the First attempt! I was impressed with his Patience and Professionalism. His friendly Approachable Personality was a great help. Well done to him for putting up with me for over 60 Hours!! Definitely would recommend to anyone who asked..... Gordon T. (North Prospect). Martin Is the Best Driving Instructor Ever!! I passed First Time after 22 Hours. Thankyou Martin for putting up with my moods....Martin is extremely funny...Ive got lots of Fun Memories. I will Definitely be recommending Martin to Everyone! Thankyou....Robyn K. (Kings Tamerton). I Have passed my test first time after 40 hours lesson with Martin. I Don't think I could have done it without him. None of my friends passed on the first test, so I believe I will fail as well, but he allways made me think Positive. He's very patient, good sense of humour, and brilliant. He's not just taught me pass my test, but also taught me to be a safe driver. I definitely recommended him as the best driving Instructor....Thankyou very much Martin, all the best for you....Alice T. (Honicknowle). Martin is very patient and managed to put up with with the tantrums of a hormonal, pregnant woman! The man deserves a medal! i did 40 hours and passed first time. Would highly recommend. Thanks for everything....Jessica B. (Crownhill). I would like to thank Martin for his patience! He is a super Instructor, kind, so funny and has a wicked sense of humour! Made me feel at ease everytime. I would, without a doubt, recommend anyone to go and learn to drive with Martin, in fact, once my son is ready for his lessons, Martin is the man I shall be ringing! Thankyou Martin.....so much.... Saffy P-J. (Torpoint). Martin is an excellent Instructor. I would recommend him to anyone. Passed both my Theory and Practical Tests in 30 Hours. Cheers Martin. Thanks for all your help! John M. (Higher Compton). After a few lessons and 3 tests with a different Instructor, I never thought I would pass. I didn't have the confidence before I started learning with Martin...he was amazing! Such a calm Instructor and was there to help me with anything. After about 20 hours with Martin, I went for my test and passed!! I was so happy that he'd taught me to drive well. I would recommend Martin to anyone who is thinking of learning to drive....You couldn't get a better Driving Instructor. Thank you so much Martin! !....Jenny A. (St Budeaux). Martin was an absolute legend. The best thing about learning to drive with Martins Driving School, was that Martin didn't simply teach how to pass my test...he taught me how to drive. If you're like me, and you need to know what to do and WHY to do it, I would highly recommend Martin.... Will Fletcher. (City Centre). Every Lesson was a Laugh with Martin. Very good Instruction, and easy to to talk to....Ben H. (Plympton). Martin proved to be a freindly Instructor. who I didn't have any trouble in asking questions. I would recommend him to anyone. Thanks again Martin....Michael H. (Plympton). Learning something new approaching middle age is not easy...I was extremely nervous, cautious and at times negative, but Martin was very patient, supportive and positive. He wouldn't let me give up, when at times I thought I was hopeless!! I'm astounded I passed the practical test in 11 months, thanks to Martin, and look forward to the opportunities driving will bring to my life. Thanks again....Victoria E. (Mutley). I Passed my Driving Test on the third occasion. I still cant believe it! I thought It would never happen, but Martin never gave up on me. When I first started driving I was very nervous, so it took me quite a few lessons before I could move out onto main roads. I did all my lessons (124 hours!) with Martin. I didn't have anyone's car to practice in which may have speeded up my learning, but then I'm quite lucky I haven't picked up someone else's bad habits! I would recommend Martin as a good instructor to anyone who's thinking of learning to drive. He's very patient and has helped build my confidence a hundred fold. When I made mistakes he'd allways help by explaining where I went wrong and how to put them right. He's not scary like some instructors that I've heard about that start shouting and going mad every time you make a mistake. He's very understanding and knows that some people just need a bit more time. I'm actually going to miss going out for a drive at the week-ends now as I save up for my first car. I really enjoyed learning to drive. Thanks Martin!....Belinda B. (St Judes). Just passed my test today, first time, and must say all was down to Martin. Couldn't have done it without him. He is a great Instructor. I would recommend him to anyone!....Scott M. (St Judes). Martin is a great Instructor. He is really friendly, and gave me the confidence I needed to pass my test. Thanks again Martin....Sarah C. (Saltash).